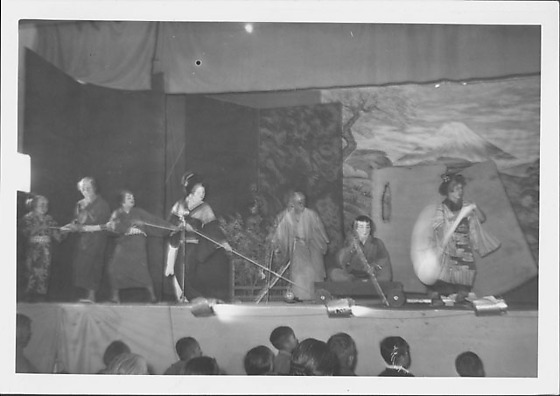 Four actors in Japanese costume pull man on "boat" while woman paddles on stage during Kabuki performance at Rohwer concentration camp, Rohwer, Arkansas, 1944. At L, the actors pull a long rope attached to a wagon on which a man in kimono sits cross-legged, pushing with pole. Another man in light-colored kimono stands in C, slightly blurred. An actor in a young female kimono stands at R paddling, slightly blurred. Heads of audience are visible at B edge. Written in pencil on back, L edge: 25-3-F Kuma 2 mai [In Japanese] / 11-2-C Yamasaki 1 / 38-3-A Masuka 1 / 15-6-D Morimaka 1. Written in pencil on back, R edge: 5 12 E Mori 1. Written in blue ink on back: 6.